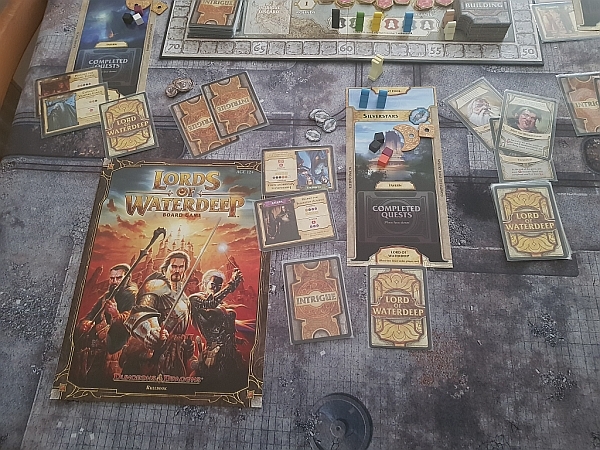 This is mostly a worker placement and resource collecting game but with a random selection of quests to complete, intrigue cards to mix up play and buildings to build for resource bonuses and bonuses for those who built them if another player uses it, there is a lot of variance in play so no two games are the same. 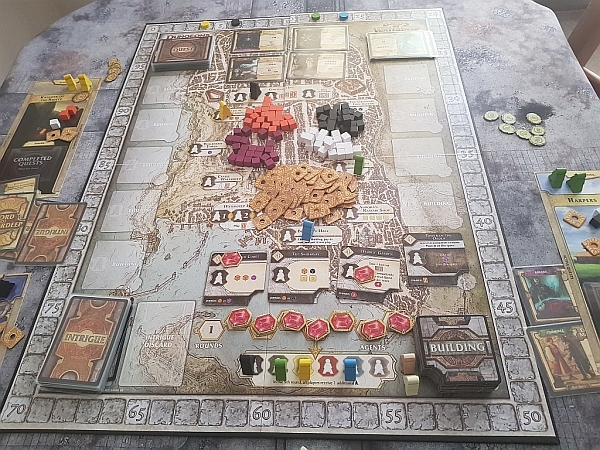 You win by having the most points (there is a score track on the edge of the board) points are gained by completing Quests, from building buildings, from some of the intrigue cards and bonuses from your lord at the end of the game. It is possible to steal resources from other players with some of the intrigue cards or to give some one a quest that they must achieve first that doesn’t give them many bonus points. The resources needed to complete the quests in the game are the classic adventurer types, fighters, mages, rogues and clerics Which are represented by coloured cubes. The quests also come in four types, Arcana, skullduggery, warfare and piety. This game is a great little game which doesn’t take too long to play about 1-2 hours and is for ages 12 upwards and 2-5 players can play. The fact that it bridges the American game style and Euro game style means that it can appeal to more players. You can order it here.